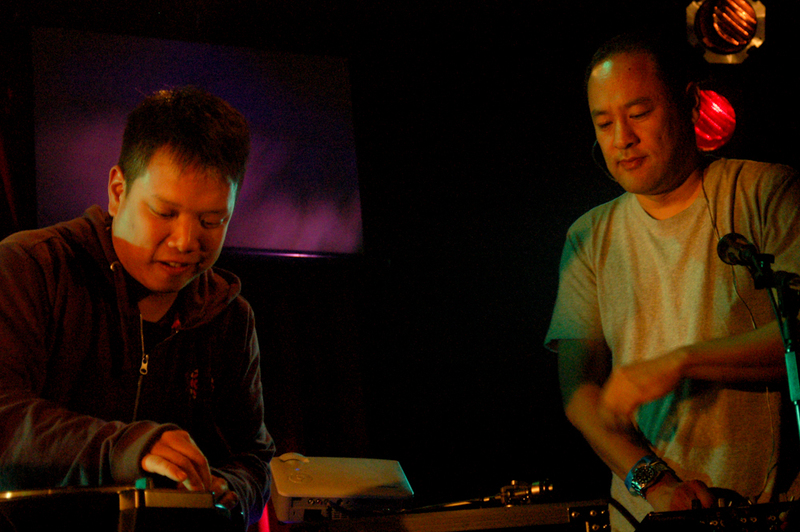 Eric San has been using the moniker Kid Koala for the better part of his 20-plus years in electronic music. He’s become somewhat of a renaissance man, tackling multiple projects that immerse the listener in music, a graphic novel or even a puppet show–really anything that strikes his creative fancy at the time. 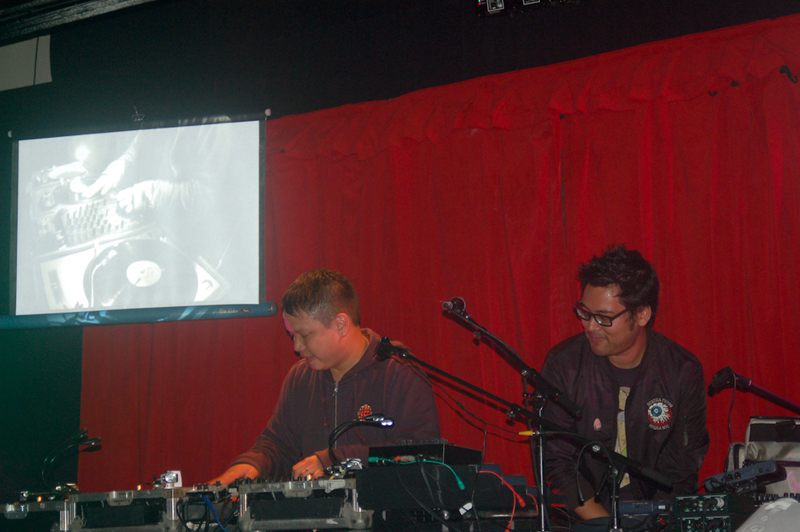 His collaborations with Del the Funky Homosapien and Dan the Automator as Deltron 3030, as well as his solo work with a wide variety of artists, have become points of influence for kids looking to become scratch DJs. 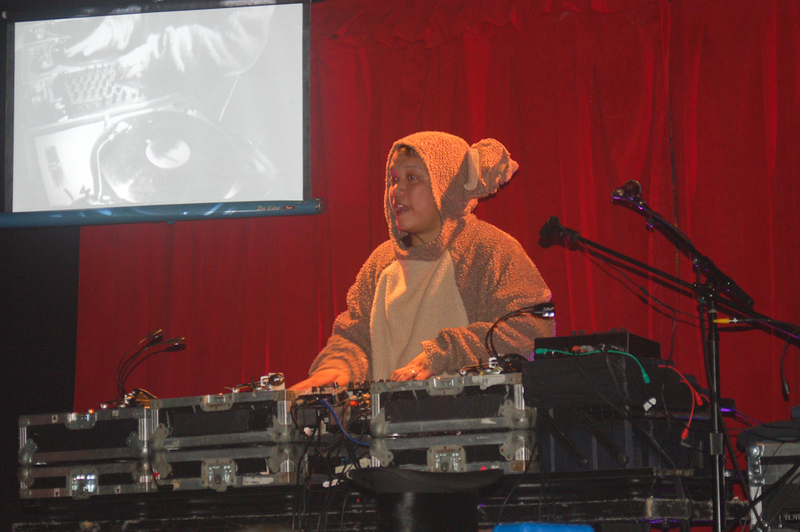 Kid Koala’s music is not easily defined. He’s run the gamut from funk to straight-up hip-hop to blues. His newest record is the second of a trio of ambient albums entitled Music To Draw To: IO. The album is full of beautiful, surreal landscapes and collaborations with vocalist Trixie Whitley whose otherworldly singing pairs perfectly with the ambient music. mxdwn had the opportunity to talk with Kid Koala about his constant musical collaborations, the gift from Radiohead’s Colin Greenwood that assisted his ambient intentions and the rumblings of new music from Deltron 3030.
mxdwn: You have had such a varied career in electronic music, but what brought you to this point of wanting to make a series of ambient albums? 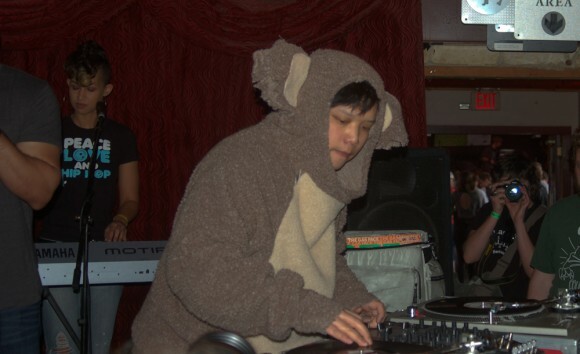 Kid Koala: I think my interest in the music started really rolling in 2001. I would say that this one record, Isan’s Lucky Cat, was gifted to me by Colin Greenwood. We were on tour, I was on tour with Radiohead for Kid A and Amnesiac, and we were in a store. Prior to that, I had big funk collection, jazz collection, even electronic collection but more on the beach-y side. And we were in this store Other Music and Colin said, ‘Have you heard this Isan record?’ And I hadn’t, I wasn’t familiar with them. And he says, “Oh, you gotta hear this,” and he went and actually bought it for me and just handed it to me. And I don’t know about you, but when Colin Greenwood buys you a record, you listen to it. And so, I listened to it, and it was an immediate thing where for the rest of the tour it just became my, sort of, wind-down music after the shows and stuff. I loved how layered it was, and it was actually the first ambient record I really spent a lot, a lot, a lot of time, just cycling, just trying to dissect, study how it was… I mean, I have other ambient records and stuff, even probably dating back to the ’70s, but I think that record, for whatever reason, it just became the soundtrack of my whole tour. And since then I’ve kind of studied and gone forward and backward with the ambient scene, just trying to discover and learn more about it. So, I would say that sort of kicked it off. The other thing was the winters here in Montreal are like five months long. And after about a decade of trying to make party music in January, I decided it just didn’t seem natural. It’s almost like you’re fighting your natural animal instinct to hibernate. It’s like, you’re trying to conserve energy, it’s a more restorative time of the year I think. For whatever reason, I guess I have a little bit more of a quiet side, always had. Whether it was drawing comic books, I didn’t always have to be in the middle of a party all the time. So, I just decided to embrace the fact that these winters aren’t gonna change. They’re always gonna be five months, and they’re always gonna be a little bit more downtempo, for lack of a better word, and so that was it. And then once I did that I was like, okay, it feels right at this time of year to be making this kind of music here, rather than just pretending that there’s a party going on. Because there’s not. I mean, and you see it, you see everyone trying to escape, everyone’s like going to South by Southwest or down to Winter Music Conference. You have to escape it. But if you don’t try to escape it, and you actually embrace what’s happening with everything, the trees, the fact that there’s no tourists here right now. It’s a little calmer, it’s just got that chill vibe. So that’s when I started deciding to see if I was alone in thinking that way, knowing that a lot of my actual artist friends or studio friends were working, whether it was an animated film and their animating, or their writing or whatever, nobody was leaving their houses because it was so cold. And I said okay, I’m gonna host this event Music To Draw To. This was ten years ago now, 2009, because at the time I was working on the Space Cadet book and I knew I had at least seven months of isolation, like solitary drawing time ahead of me. And that’s kind of depressing, it’s almost like sentencing yourself to isolation. For me to finish this project that I’ve started, I’m gonna have to draw by myself for seven months. And so, I said, well let’s do an event where I can draw while also being near people. We don’t have to be actually interacting, just the idea of, almost like a studio hive kind of mentality. I would just play music that I like to draw to. And this became a really, really popular event here–and still is, in the winter. And I didn’t know whether anyone would show up the first week, but everyone came and liked the idea that there was kind of, this Monday night event where you could unwind, unplug and just be creative for a few hours and check out some tunes. I will say, the first time I was buzzing at the end of the night. Like the same kind of adrenaline rush that I might have from rocking a party and having a mosh pit going. It was the same type of synchronicity, only it was on a more focused, creative level. So, imagine the room was sort of packed full of people, but nobody’s talking. In fact, everyone’s just in their beta zones or whatever, and really just cranking out their work. And some people would say ‘Hey, I finished a whole sketchbook tonight. I haven’t done that since high school.’ The idea that there was this, sort of, other function for music that I had in my own collection like I have my go-to drawing records. But the idea that, yeah, there is a space for this type of music to work for people, and it does have that function. Like something you do to, kind of, slow time down as opposed to speed it up. mxdwn: IO is an absolutely beautiful record and on a few of my favorites, “All For You” and “Lost At Sea,” Trixie Whitley brings along a very subtle tension. How did you end up with that collaboration on the record? Kid Koala: Well, here’s the thing, I didn’t know how it was gonna work. I had met her a few years ago through a mutual friend, and I checked out her work. I was really into her whole style and everything. I went to see her, we hung out in Montreal. I went to see her play when she was here. Yeah, she’s a phenomenal talent. When I was starting work on IO, I didn’t actually have anyone in mind for vocals just yet because I was still doing the instrumental. But she texted me kind of out of the blue, I think in late summer, and she had just come off of some whirlwind tour and she was like, ‘Hey, I finally got a chance to listen to that Satellite record, and I just wanted to say that I’m really into it and it’s been on repeat here’, and [it’d been] helping her get into the zone and everything. And I was like, ‘Whoa, that’s really cool.’ Because I had given her the record many months prior to that, so I had just sort of forgot about it. And then she sort of reached out and said that she really appreciated the record. And at that moment I was like, wow. I didn’t know how she’d respond to it or anything and I would have never guessed that even listening to her voice that ambient stuff was necessarily her bag or anything, or on her radar. So, then I just sort of thought about that for a second like, I’m kind of halfway through the instrumentals for the next chapter, do you wanna come guest on this one? And she agreed. And so, I had no idea what the end product would sound like, knowing that she comes from more of an almost R&B background, I don’t think either of these things are on these tracks. I mean, I’ve done like a blues record before. I’ve done more funky stuff with breaks and things like that, but for this one, I didn’t really know. I was like, is this gonna be like ambient R&B, that sounds like an oxymoron or something. But I played her the track, and what’s great about Trixie is that she has this uncanny ability to just tap into whatever vibe it is and channel something from within her world and her experience, and bring it in a way that’s so purely Trixie Whitley, but at the same time fits in the context. I think the first thing we recorded was “All For You.” And after that I was like, oh, wow, she really turned it into this, almost, like a beautiful lullaby or something, this kind of soul lullaby, but there’s no drums. This ambient thing. And yeah, she’s great. And it was similar, like even with a track like “Hera’s Song” or something where I said, okay, well, this is clearly a darker, moodier piece. She just went in deep and channeled this kind of anger or fueled that or attached to something there and went and sang through it. And it had this sinister vibe to it. Like she really got into the idea of taking on these characters that were written into the lyrics and just sort of singing for them in a way I think that no other singer could have pulled off. That’s what I’m saying, she’s just got this incredible range. mxdwn: When I read about hints dropped through IO, you speak of a narrative guided by the Greek character Io. And I was hoping you could elaborate on that a bit. Is the record meant to be a concept, is it meant to have a story parallel it? KK: Well, I mean, I think these are very collaborative records. The concept was to collaborate, for me to get into a situation where you have to work with somebody, and learn and navigate how everyone can work together and apply their skill sets to something that might be outside of each party’s regular style of music. So, it was one of those things where there was some exploring into how you should approach it. At the end of the day I do think they’re very personal songs, very personal lyrics, but by having that degree of separation of an outside narrative to catalyze it and characters through which we’re writing for I felt it was… It was the same thing with Satellite, just sort of allows it to unlock and help guide certain writing processes. At least for me lyrically, trying to find a way to write a personal song that Trixie could pull off, that relates to who I know, the parts of her personality that I am aware of and some of the things that I know she thinks and her outlook, but then do it through an actual third character. And it’s just sort of, almost, a theatrical way of doing it. But I did write them for her, knowing that she’s an incredible interpreter above all that also. So, at first it was very simple. Satellite was set on Mars and we just decided, I just decided, I’m gonna go further into space, so I was reading about other planets in the galaxy, yada yada. And I was reading about the moons of Galileo, all of which I knew were named after these Greek, mythical figures. But I wasn’t that familiar with the intricacies of their stories. But when I got to Io, I started reading about the Io myth. And there was definitely something there that reminded me of something that Trixie might be able to relate to, just from hanging out with her and even knowing things about myself, like the restlessness in terms of being a musician, almost like a troubadour, in some cases. In the current age of being in music, sometimes you do feel like you’re just trekking non-stop around the world and there’s connection and then there’s disconnection also, in that process. Anyways, there was something that kind of compelled me to look into it further. And then when I was talking to Trixie when she got here, we were just reviewing everything, it was just sort of this more thorough getting-to-know-you period of just discussing everything, from what’s happening in the news, what’s happening in your family life, what’s happening in your music career and just the things that were on her mind. And I felt like ‘Hey, you know, what do you think of this Io storyline?’ And we went through and, yeah, it just seemed to fit. And so, yeah, by no means is it a read-along, storybook soundtrack to the myth, but I think there were certain key events in that myth and also key visuals in the myth that kind of triggered an idea, or a seed for a song. So, the characters themselves, she sings from both Io’s perspective and Hera’s perspective. By no means am I an expert on Greek mythology, it was just a starting point. And I think when people read into if they choose it, if they wanna read the Io myth, they can kind of hear some of that stuff that oddly, I guess this is with any myth, that’s still relevant today. The same kind of stuff is still happening today. The idea of people’s lives being derailed by some other force, then having to live and learn through that and in some ways just dealing with all of that on a metaphysical level. mxdwn: You also have a background in graphic novels as well, do you think that these records could fit that mold? KK: You know what, I have no idea. At this point in my life, I’m like, I don’t really try to predict anything. I mean, in this lifetime, there’s gonna be certain people, there’s gonna be certain inclinations to work with certain people, and that’s the thing. Like you’re gonna learn from that process and I feel like, who knows. For instance, Nufonia, which is touring now, like we’re about to tour like five continents, it’s a live version of a graphic novel that I wrote in my 20s. So, decades later I’m here doing a live show, having a great time, with puppeteers and cinematographers and a string quartet. I would have never, ever, ever thought that it would have evolved into something like that. So, I don’t really know. For now, it’s just the record comes out. If it leads to other things, great. mxdwn: You recorded some of the album in the National Music Center in Calgary? I wanted to hear a little more about the place from your perspective. KK: I think the way a scratch DJ might hear the world is in very, very microscopic slivers of sound, sometimes. Like my ears are kind of really tuned to the most minute things that I think a lot of people might not even hear or register. Like, oh, no, those things sound the same and I’m like ‘No, actually they don’t.’ So, not to be like, oh, get all ‘wine tasting’ about it or anything, but essentially when it comes to the scratch DJ culture, like even when you’re making breaks and how you’re stacking snare drums that have a certain kind of hit, it’s like you might toil a lot over trying to just stack the perfect break or get into that swing the way you need. That type of microscopic way of working on music sometimes, it’s like when I’m applying it to more ambient stuff, it is about tone and it’s about palette. Having a palette of tones that can be complementary or you might wanna throw something in to add a little sizzle or a little coldness or use a more modern tone to juxtapose against a little more old, fuzzy, old-school tones. It sounds strange, but it’s kind of like the approach to the Music To Draw To records is a little more like, you’re just painting in layers. So, what National Music Center has and houses is one of the most extensive keyboard and synthesizer collections in the world that go all the way back to centuries-old harpsichords and things like that, all the way up to the most modern synthesizers. And everything is tuned and up-to-spec and everything. So, it literally is a dream playground for anyone who’s interested in the subtleties of all the different tones that you can get from that place. So, letting me loose in the synth room is just pretty much like, I’m good. Oh, yeah, you guys need to close tonight, it’s cool. I won’t even sleep, I’ll just work. But yeah, they did have to kick me out when they closed. But it was one of those things where I would have been fine if they hadn’t. And, again, time just ends when you’re in there searching for tones and trying to get these machines to play together. How they can add to a track? What’s unique about each keyboard? And trying to get it to work with the mood of the track or something like that. It was great, it’s just, I don’t know. I imagine it’s like being a chef and then all of a sudden, for the first time, going to some market that has like 50 spices you’ve never heard or tasted before. Like okay, this changes everything. mxdwn: You are working on trekking around North America working with visual artist Karina Bleau. Did you kind of let her loose on the visuals for the videos and the show? And I was like, ‘What is that?’ I had never heard of it. And I said, explain yourself. And she showed me some still frames of some of it, mixtures and crystallizations that she could do live. And I looked and I said wow, it literally looks like NASA photos or Mars landing or something. And I asked her, can you do this in real time? How long does it take for you to create or get this image? She said it depends on what the process is, some crystallizations take a few minutes, some might take a half hour, but there’s certain things that you can do in real time. To the point where she can actually play almost like she’s in the band. Like she can actually hit a chord change, or when we got to the chords, or if there’s something that happens in the bridge, she can time certain reactions to happen. This was definitely a little more brain massage-y, what we were doing. But I had been there before to see other more, kind of, digital, visual, kind of motion graphic stuff there. But to see Karina work there it’s a whole different thing. It’s almost like she had control of the sky, you know what I mean? Or you hear like, oh, okay, there’s gonna be an eclipse or something and it will have this sort of visceral effect on everybody on the planet. It was almost like she had that, kind of, control over the visual space, the light, essentially. And sometimes what she was doing looked like Aurora Borealis. Other times it was a chemical reaction where you’re watching certain things dissolve and how the bubbles are reacting, and how the crystals are coming out of it. And it’s just so captivating to watch. The whole ethos with her work is that she focuses on what’s incredible about nature and the natural aspects of something. Okay, like, here’s a liquid mixing with another liquid, because you can watch that and kind of stare at that for hours. You know what I mean? And I’m not just talking like a lava lamp. I’m talking like stuff where you’re just endlessly intrigued by it. And I think she was… She’s never had that type of canvas to work with, where literally your whole field of vision is what she’s mixing together on there. So, yeah, it was a lovely surprise. I’m gonna have to go back there for sure. mxdwn: You’re taking IO and Music to Draw to on tour. Do you foresee putting out any new music? Will we ever see any new Deltron 3030? KK: Yeah, Deltron, I mean, there’s all those things that are kind of in the cards right now. I guess it depends on everyone’s schedule, what ends up being on the front burner. This year the main sort of target is in November for us, because we’re gonna have a world premiere of a new show, kind of like the Nufonia show. A new show called the Storyville Mosquito that’s a story that I wrote, yeah, decades, maybe over a decade ago. And then now we’re finally gonna present it as a first time as a live, Nufonia-style, live silent film show. So that’s gonna be, we’re gonna be in production a lot this year. But that doesn’t mean, the other stuff… I’m available, it just really comes down to whether I host a Music To Draw To or if we’re doing a Satellite show or something. It just comes down to whether the schedules align and the promoters, when they want the shows to happen. On the Deltron news, I don’t really have anything official yet. I imagine it’s really more on Del, when he’s ready to do the next one. There’s probably beats already cooking on Dan’s side. In fact, I remember having done some turntable work on a couple of beats already, but it’s still in its preliminary stages. I’m already working, started some on my next album and then also another collaborative hip-hop record, which I can’t talk too much about right now, so there’s that. For me, again, it’s a balance actually with the seasons. Like, if I were to do one record a year from now on, it would probably be like, that one will be a winter record and that one will be a summer record like with beats and stuff. That just seems more balanced to me, but I think, absolutely, I think now the way the touring is structured, I’m not really trying to create stuff where I get burnt out on it. Meaning, well, we’re gonna put out a record and the whole touring cycle will be two years with just that record, and then you’ll try and go back in the studio and not hear anything in your head because you’re just so in a loop. And so now, it’s more like releasing stuff and actually having the shows kind of live on their own terms. For instance, Satellite Turntable Orchestra was originally developed for that first Music To Draw To record, to do a, quote, live version of that record, interactively with the audience. So, anyone in the audience who’s got harmonized tone records that they play and kind of play together like a vinyl orchestra. And we’re doing songs from the first record. And now that IO is out, we’re gonna start adding those songs into the set for Turntable Orchestra. So, it can evolve as the show, it can still be referred to like current releases, but it’s the more downtempo show, whereas like, Vaudeville is more party show. And so that one we adapted for Floor Kids, when the video came out last year. So, it’s the idea of just constantly kind of evolving all of those concepts, all of those shows and kind of growing them over time. Rather than just kind of burning yourself out and being like, okay, if I never hear another ambient track again I’m good. Or if I never hear another beat I’m okay. You know what I mean? I don’t wanna take it to that limit, just keep it in balance so that all the projects are kind of happening concurrently. It just depends which one is kind of being booked or is on the front burner.